Having worked on multiple political campaigns (including Obama’s), Zain Velji is helping build Northweather into a busy political strategy company while working on several non-profit boards. For years, the Ismaili Muslim community in Calgary hosted a hugely popular breakfast on the first Saturday of Stampede. But in 2015, that Saturday fell smack in the middle of the holy month of Ramadan, a time of “heightened piety, spiritual awakening and fasting during the day,” Zain Velji says. Instead of cancelling, Velji helped transform the event into the “Break the Fast Sunset Breakfast,” giving Calgary its first evening breakfast, beginning just as the sun set at 9:53 p.m. That kind of problem-solving is typical of Velji and a key to his successes. Velji sits on the board of Calgary Reads and is the former chair of its governance committee. He also serves on the board of the Canadian Children’s Book Centre and on the strategic committee of the YMCA Calgary board. And he’s active with the World Economic Forum’s Global Shapers Calgary Hub, the Ismaili Council for the Prairies and the Aga Khan Foundation’s World Partnership Walk. As partner and vice president of strategy at Northweather, a technology start-up that develops digital strategy apps, platforms and campaigns for non-profits, corporations and political groups, Velji has helped to grow the business by 25 per cent since coming on-board in January 2017. For Velji, professional successes and volunteer commitments have been inseparable. For example, he saw Northweather’s FieldHQ campaign strategy technology in action while he was managing Naheed Nenshi’s mayoralty campaign in 2017. The products helped shape Nenshi’s engagement and communication strategy with his support base. Now, Velji is part of the team commercializing FieldHQ at Northweather. 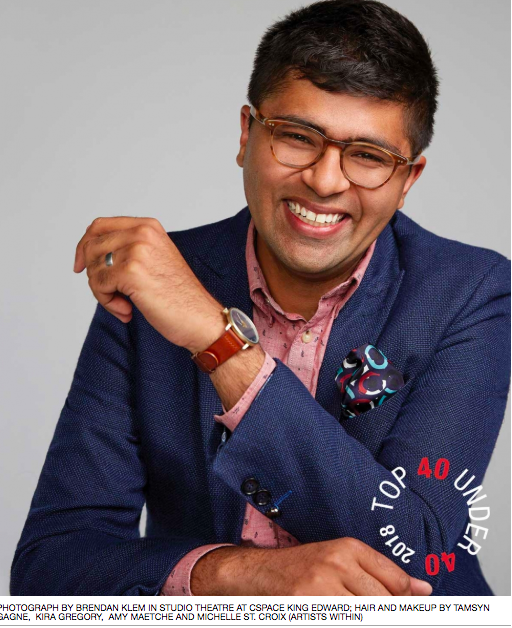 Velji was also one of the masterminds and commentators on The Strategists podcast, which has drawn an audience of 40,000 over its 68 episodes, and led to ongoing appearances for Velji on local and national CBC News. Whether he’s working or volunteering, Velji wants to make “an impact on community.” At Calgary Reads, he was part of the driving force behind the creation of the Children’s Reading Place in Inglewood, a haven for young bookworms where they can get free books.